This picture was taken by my sister Kristi while she lived in Japan. I made this into a pendant. This picture was taken at a temple in Japan in Takayama. There are 101 Buddha statues and they say if you place 1 Yen on the base of each statue your wish will come true. 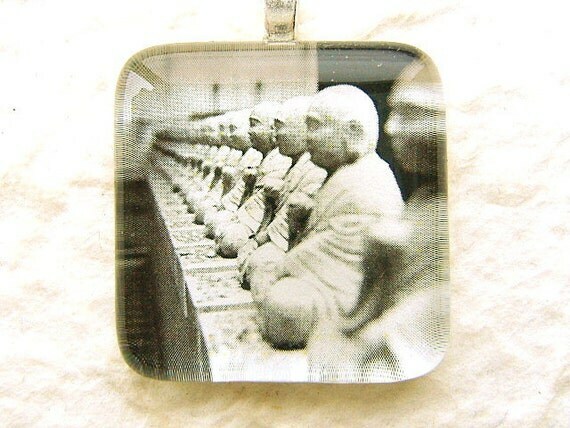 This glass pendant measures 2.5 cm (1 inch square). The glass has rounded edges and it is adhered to the back of the glass then sealed with a non-toxic lacquer to protect it. Attached is a silver plated bail. The pendant is water resistant, but not water proof so please avoid wearing the pendant during activities where it could get wet.